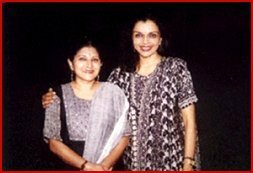 After Pittsburg, the visit to USA in the summer of 1999 saw another unique workshop fructify at Houston between Anita Ratnam, two senior dancers of the Arangham Dance Troupe and Rathna Kumar's Anjali Dance Company, Houston. 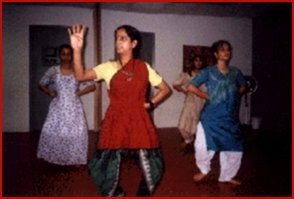 The school attracts Indian students to train in Kuchipudi and Bharatanatyam dance styles. Over 30 students from school and college, professionals and working women, participated in a strenuous and invigorating exercise that saw some amazing results. 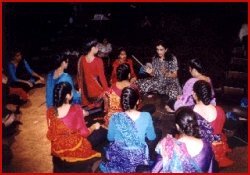 Anita and her dancers encouraged discussion and debate to choreograph and re-invent traditional rhythms generic to the discipline. An active dialogue ensued on all other aspects of dance - even costume, music and lighting, and a fresh gamut of ideas exploded. "TALKING DRUMS" was presented on July 9, 1999 at Hamman Hall, Rice University, Houston, Texas. 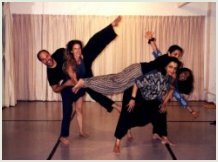 A succession of ensemble pieces, solos and duets were selected to showcase the rich choreographic talents - "Ta-Ki-Ta-Tease" which reflects urban friendship between a man and woman, "Unsaid" which describes the often devalued friendship between two women and "Forest Frenzy" which displays the exaggerated devotion of a hunter. 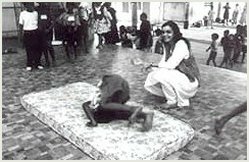 The performance sought to explore the vast possibilities of classical Bharatanatyam and to reach out to newer and younger audiences for Indian performing arts at USA.